Guys. It’s allllll the Asian flavors up in this house these days. 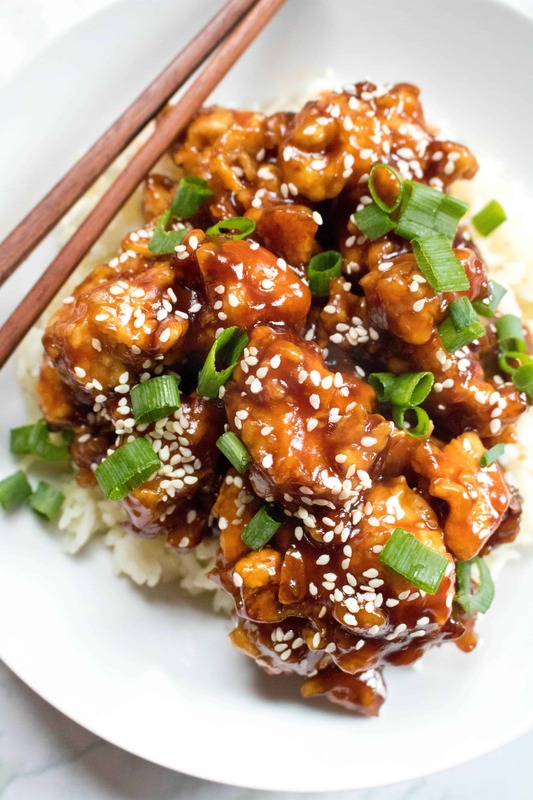 From our Sweet and Spicy Sriracha Chicken Thighs, to 20 Minute Sweet and Spicy Noodles, and Homemade Hot and Sour Soup, and now this Homemade Crispy Sesame Chicken, our weekly menu has been sooooo deliciously Asian. Even though people often try to speak to me in Japanese, Chinese, and Korean (and any other Asian language that the speaker knows) because I am in Korean, I grew up in New England and was raised 100% Polish. Seriously, the town I grew up in had two Chinese food restaurants and one Thai restaurant, that’s it. Meanwhile, my dad and grandmother made pierogis. This much Asian deliciousness in our house isn’t common, but it’s now going to be because these homemade versions are so easy. With a two year old and a (now) 3 month old at home, dinner has to be easy these days. But even though “from scratch” and “homemade” can often sound time consuming, it doesn’t have to be. Plus, you probably already have everything for this recipe in your pantry. Maaaaybe you don’t have rice wine vinegar. In that case, you need to add it to your pantry immediately. Want to be totally extra? Make your own ketchup and brown sugar! The most time consuming part of this recipe? Breading and frying the chicken. But it’s also one of the most satisfying… because really, who doesn’t love a good breaded and fried piece of chicken? It’s time well spent. When my husband took his first bite he went, “Oooh crispy!” Yup. Worth it. Then it’s just mixing the sauce and tossing your deliciously breaded and fried bits of chicken in it! Topped with sesame seeds and green onions annnndddd done. I mean, c’mon. How good does this look? Trust me, it tastes that good. I wish I could take credit for this recipe, but I totally can’t. This is a creation by Dinner at the Zoo, who is amazing because all of her recipes are On. Point. Especially for a busy family! My husband and my two year old could not get enough and have already requested it again! 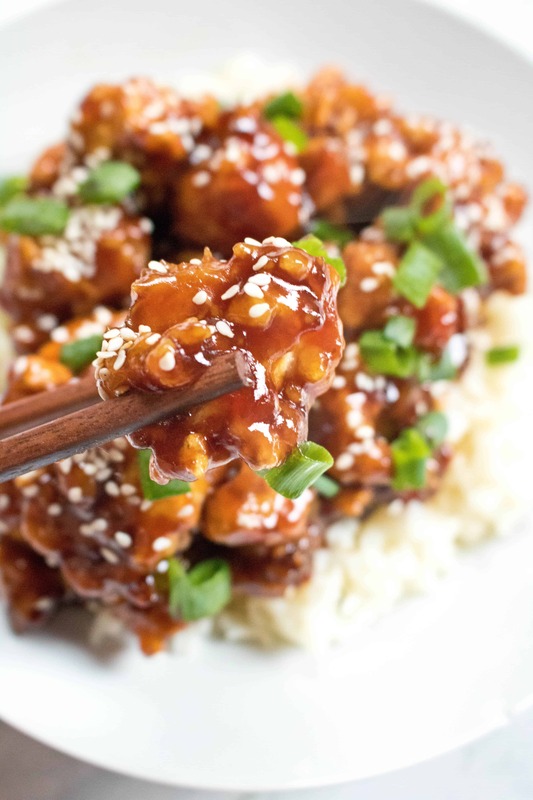 So skip the take out and make your own Homemade Crispy Sesame Chicken! Don’t forget to tell me if you’ve made the recipe on Pinterest, Facebook, Instagram, or Twitter! Or leave a comment below – I love hearing from you! Whisk the eggs and add them to a bowl with salt and pepper to taste. Combine flour with 1/2 cup of cornstarch to a bowl. When oil is hot, add about 8 peice of chicken at a time and cook for 5 minutes or until crispy and golden brown. Repeat with all of the chicken. Drain the chicken on a paper towel lined plate. 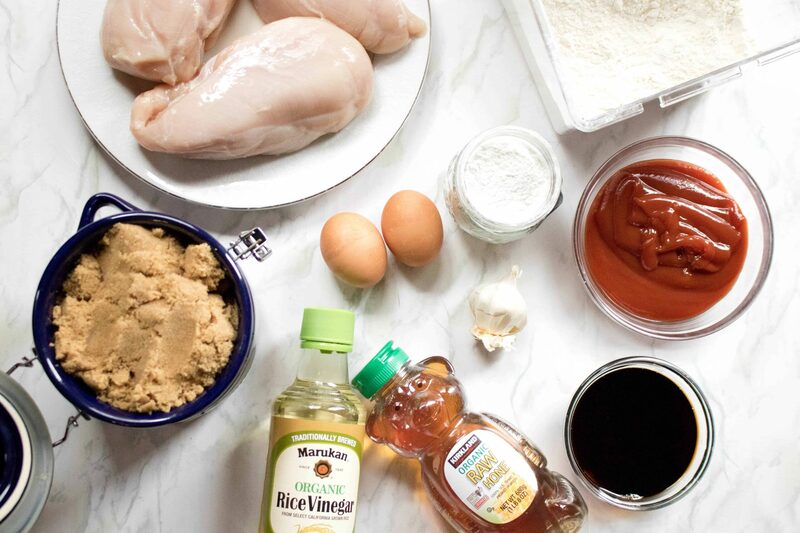 Meanwhile, while the chicken cooks, combine the honey, soy sauce, ketchup, brown sugar, rice vinegar, sesame oil and 2 teaspoons of cornstarch in a bowl. Heat the tablespoon of sesame of oil in a large pan over medium heat. Cook garlic for 30 seconds then add the sauce and bring to a simmer. Cook for 3-4 minutes or until just thickened. Add the chicken and toss to coat with the sauce. Sprinkle with sesame seeds and green onions, then serve immediately. I love the sound of this recipe. 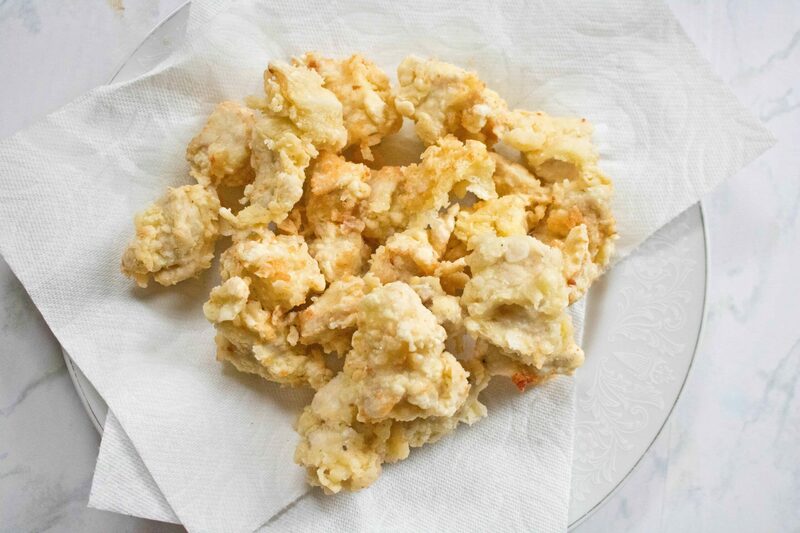 This would be great as an appetizer or paired with some rice for a great meal. You can never go wrong with chicken for dinner. Much better than takeout! Great for both for sure! 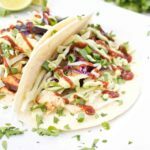 I love how this recipe uses simple and easy ingredients! I do cook some complex recipes from time to time but this one is just a rare find! Super excited to try some of your tips – thank you! Forget the take-out! Your recipe looks waaaaayyy better than anything I could order, and I can make it from home! I love it! Thank you! Yes! Nothing wrong with more sesame chicken in your life! Take out I can make at home?? Yes please!! I always make the Asian take outs at home to make them healthier. Being vegetarian, I make something similar with cauliflower and my boys love it. Chicken is the most popular among my friend and this looks so amazing. Yes- they’re so much healthier when made at home! Oooh subbing cauliflower would be delicious! 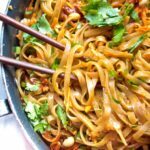 We love Asian food in our home and this looks like something I wanna make for our next Asian meal. Love sesame and love crispy chicken. 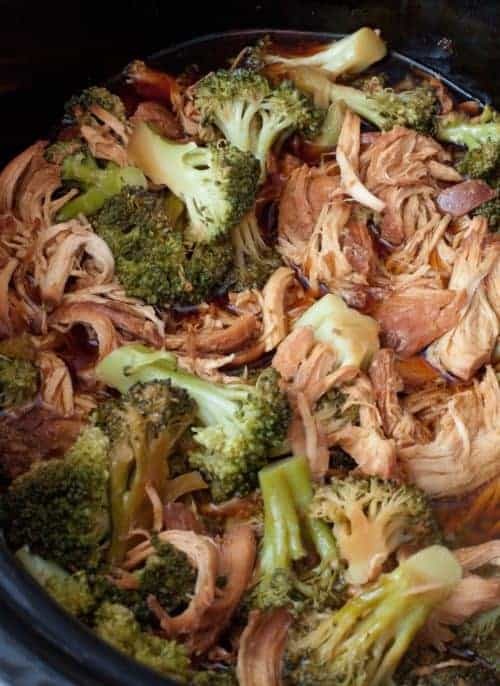 It may quick and easy but it sounds and looks like it’s got loads of flavor. I remember the days when I had two little ones 13 months apart. Yep it was busy and challenging but also great fun with the kiddos. Now I’m busy in a different way and the homemade crispy chicken would be great to serve. Can’t wait to make it. 13 months! Wow! I love having two pretty close, it definitely makes life even MORE fun! Wow! 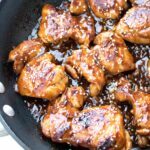 This sesame chicken looks fantastic! 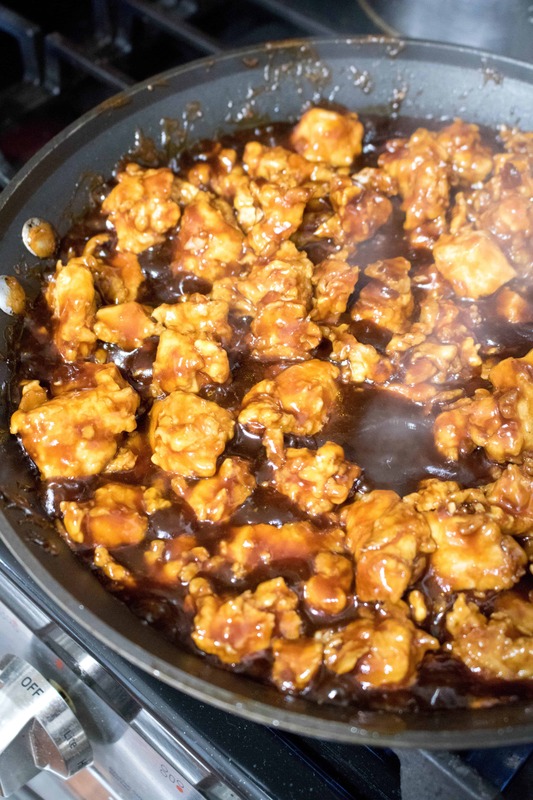 I love Sesame Chicken and I am so glad to make it at home! Yummy! It’s so fun when you realize you can make your favorites at home! This looks absolutely delicious! So much better than takeout! 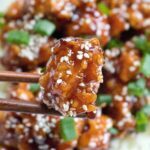 Now I’m craving some sesame chicken…my family would love this meal! Thanks, Catherine! I hope your family loves it as much as mine! This is perfect easy family weekdays dinner. I love the flavors and the look. Sound delicious too. I’m putting this on my weekly menu. Great recipe! I agree with you this is best crispy sesame chicken . 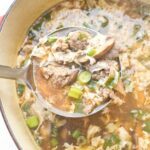 Looks like it has everything you look for crispiness, sweetness and flavors along with nutty sesame seeds. love it. Yum! 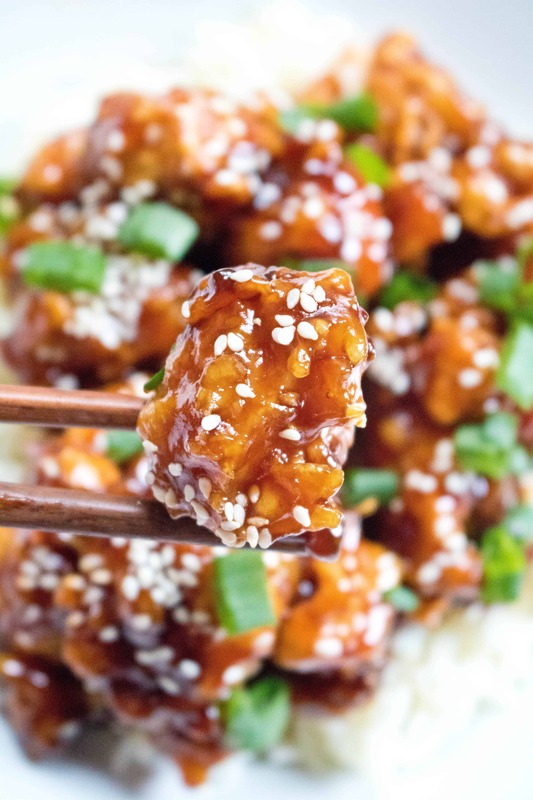 This sesame chicken looks better than takeout! I love making dishes like these at home because you get to control the quality of the ingredients and how much salt and sugar you use. Great recipe! So much better than takeout! Tasty and delicious dish.I made it in my home and get amazing taste,also enjoy the dish with my family they also loved it.one of my suggestion is that if you want more spicy you can add hot sauce and red chili. Hi Marilyn! I’m so sorry I didn’t see this yesterday – you’re SO right it is supposed to say TABLESPOON. Thank you for catching that – you’re a GREAT cook to catch it! How did they turn out?? I’m so sorry to hear you’re not happy with the recipe! Was it that you didn’t like the sauce on the chicken or were you trying to make it as just a sauce?